Jack has bully trouble. Nothing he has done in the past has succeeded. Rocket Robson seems to have it in for him. Not only is he faster and stronger, he’s just plain tricky. This year Jack, with the help of Eric, is determined to beat him. So he and Eric train and train, encouraged and supported by Jack’s mascot birds, the drongoes. But Rocket Robson beats him in all the athletic events, until there’s only the cross country to go. Colour illustrations appear on every opening, with header and footer illustrations, and differing font sizes to break up text. It’s the Year Five cross-country tomorrow – the biggest day ever for me and my best mate, Eric. It was Eric’s big chance to finish a race. And it was my big chance to finally beat Rocket Robinson. In Year One, Rocket Robson tripped me on purpose in the egg-and-spoon race. I might have forgotten about it. If it hadn’t been for what he did in Year Two. ‘Hey, Jack, your shoelaces are undone,’ he said. ‘Here, let me help. I’m good with shoelaces.’ He was good, too. Good at tying them together. Eric was even more upset than I was. ‘We need to shut that Rocket down,’ he muttered. ‘We need to beat him.’ He said ‘we’ but he meant me. Drongoes is a new offering in the Mates series published by Omnibus. 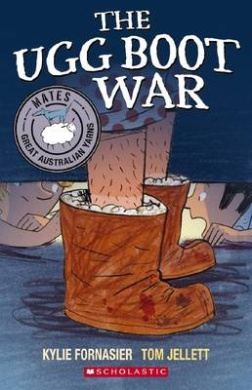 Each is uniquely Australian and offers realistic and tall-tale fiction for newly independent readers. Word styles and colours vary throughout, although the majority of the text is in a uniform font. Text variations and illustrations intersperse and add to the story and provide an accessible story for readers transitioning from fully illustrated books. Drongoes also explores friendship and competitiveness. It presents ways to deal with bullies without intervention from teachers or parents. Recommended for newly-independent readers.